Did bad weather deter your holiday in Malaysia? Can’t have fun anymore? Fret not! The Cosmo World Theme Park is an indoor theme park and the best place to be in for people of all ages, no matter what the weather be like outside! Located in the Time Square, this theme park is a great escapade to just let your hair down-right here in the city. Officially the biggest indoor theme park in Malaysia, you can thrill yourself with over 14 rides to choose from. You can choose to explore two themed areas of this indoor theme park. They are the Galaxy station and the Fantasy Garden. Both themes are amazing superb and unique in their own way and certainly promise endless hours of pure fun. If you make your way up to the fifth floor, you can explore the Galaxy themed station which is meant for the older set of crowd as the rides on this floor in this theme are of the more extreme and faster pace. The rides in the Fantasy Garden located on the seventh floor on the other hand is designed perfectly for the younger set of people-the right place to bring your children for a day of fun! The rides in this theme are slower and not to mention more child friendly. The theme park is the right place to be for everyone wishing to take a day off their city schedule. Shopping is also one possibility right here in the theme park. Children will certainly be mesmerized and excited to be able to go to a theater that caters specially for kids! The theme park is also home to a great kid’s playground. The colorful display and design of this entire theme park is certainly a must see. Then, if you the rides leave you craving for something to bite, there are many outlets opened right there in the theme park to satisfy your taste buds. 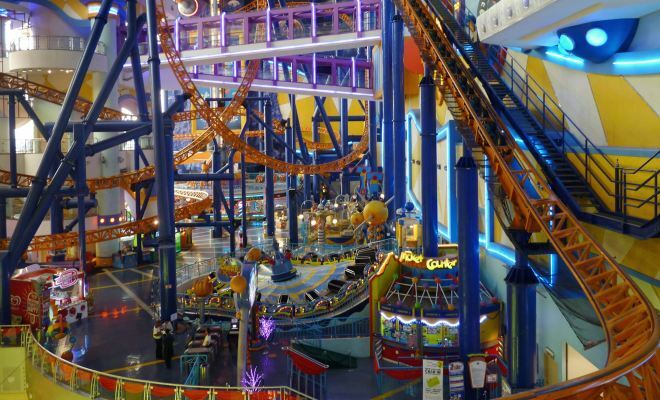 If you are visiting Kuala Lumpur on holiday or day trip, do visit the largest indoor fun park in Malaysia! Entrance fees are slightly higher during the school holidays and public holidays as well as on weekends. Although the price of the entrance fee is quite high, it certainly is worth every cent – a day at the theme park is certainly a fun filled destination for all. So, what are you waiting for? Make your way to the theme park-opened daily from 10 AM to 10 PM for your entertainment. If you wish to avoid the long queues that usually happen during peak seasons, reserve your tickets to avoid any disappointment. Located next to a popular shopping mall with plenty of dining and entertainment options. Value for money accommodation and easy access to the nearby attractions.